Sunway Lagoon is an amusement park in Petaling Jaya, a suburb of Kuala Lumpur. It features a number of attractions centered on water. Shah Alam is actually a city 25km west of KL, not a suburb of it. 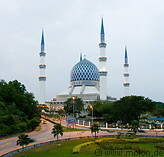 It replaced Kuala Lumpur in 1978 as the capital of the state of Selangor, after KL was incorporated into the Federal Territory. 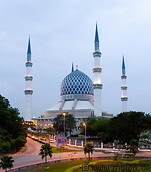 The Shah Alam mosque, known as Sultan Salahuddin Abdul Aziz Shah Mosque, was completed in 1988 and has a blue white aluminium dome.